In 2012 I was invited to take part in The Big Egg Hunt. The event invited artists and designers to each decorate a large fibreglass egg which was then placed at various sites in London. Over 200 eggs made up the ‘hunt’ that encouraged the public to find the eggs and raise money for charity. It was all rather a rush to get the work done in time for the launch in February culminating in the finale in Easter when the eggs were then auctioned to raise funds for charity. It was nice to be involved with something that would be seen by such a large and wide ranging audience who would ‘stumble across’ the work rather than going to a gallery. Inevitably there were a lot of references to birds by other participants so I decided to celebrate the less obvious creatures who emerge from an egg. The Treefrog and the Lizard are both hunting the unsuspecting cricket. 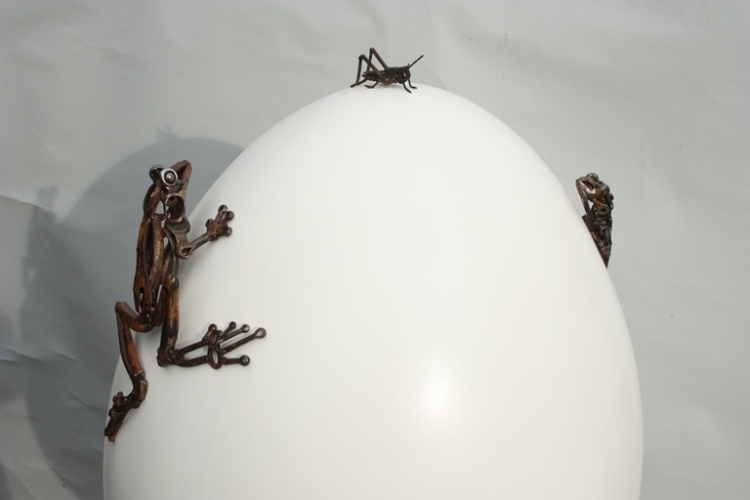 I enjoyed the tension of the piece but it proved a real challenge to get the sculptures to follow the contour of the egg and then fix them onto it. The organisers sited the eggs in various locations inside and out. 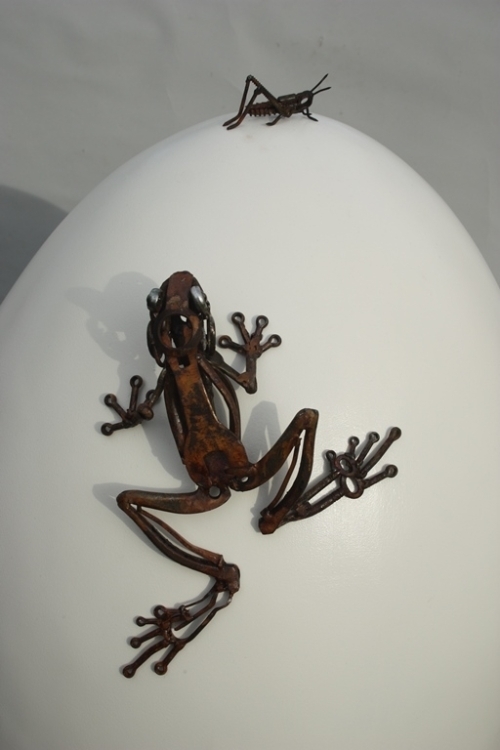 They chose to place my piece outside and sadly within 3 days two of the sculptures had been stolen from my egg. 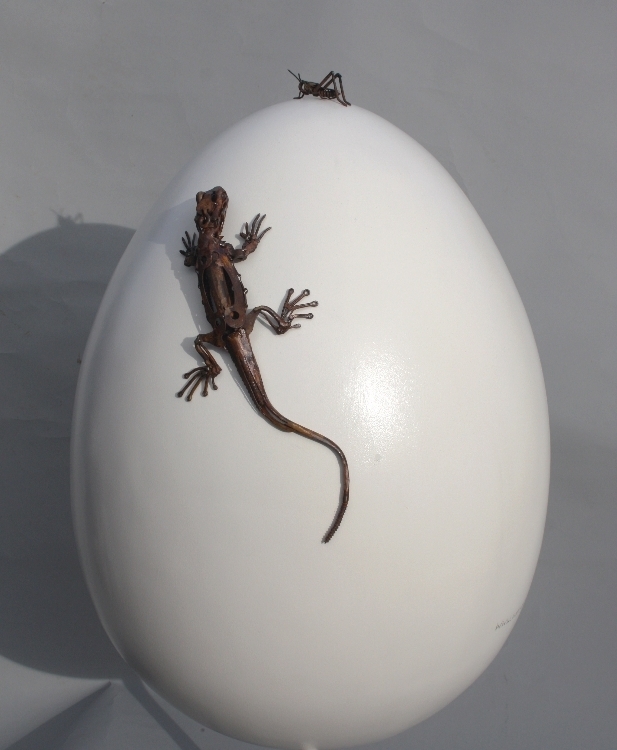 A perspex box was placed over the egg to save the last sculpture but I had to make another two to replace the stolen works. It was a rather disappointing experience. I’m sure in future the perspex boxes will be used on all the more vulnerable works. It’s such a shame that the organisers have to worry about vandalism, in an ideal world work would be admired and not damaged. This entry was posted in Public Art on January 10, 2013 by harriet mead.